It has taken a mere 62 years — a blip in the life of many a nation, many an empire — for those who pass for politicians, both civil and military, to nearly dismantle Pakistan. Those of little genius have managed to do so to the best of their ability. In the large it has been brick by brick, though at times large chunks have been done away with in one fell swoop, and on one occasion, back in 1971, an entire wall was demolished to serve the purposes of power-hungry megalomaniacs. Given all to which it has been subjected, given the warping and distortions of the national mindset, Pakistan is to be congratulated for not only having survived the machinations of its ruling cliques, but to actually still be standing, albeit in a highly wobbly mode, on its mortgaged feet. For all the wrong reasons, it is now a high-profile country in the comity of nations, renowned all over the world for being what it should not be. Each Aug 14 the nation is expected to honour the memory of the man who made it, Mohammad Ali Jinnah, and to celebrate the being of Pakistan. This year, that was denied in our capital city. 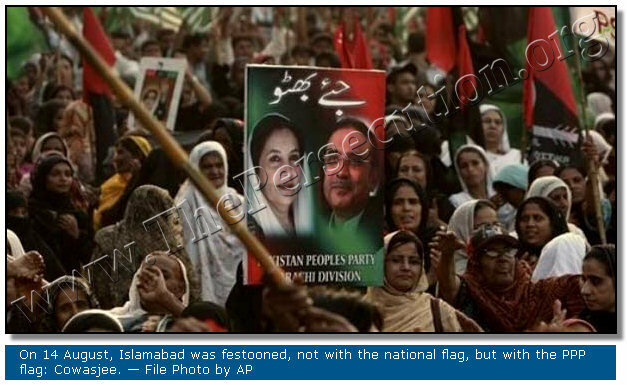 From what we have read and seen on our television channels, Islamabad was festooned, not with the national flag, but with the flag of the party in power. Our kings of straw celebrate themselves, not their country and its maker, and they rule over a Pakistan that now has nothing to do with the ideals that gave it birth. However, let us remember the words spoken by Jinnah on Aug 7, 1947 when he landed in Karachi: ‘I never expected to see Pakistan in my lifetime. We must be very grateful to God for what we have achieved.’ One must suppose that we who have survived the 62 years of downgrading must be grateful for what is left to us. But what can one make of a nation many of whose citizens are still debating whether there should ever have been a Pakistan? Those who quibble over partition should remember that by 1947 Jinnah’s firm and committed conviction was that there was no other possible solution in the face of the end of the empire. For better or for worse, the minority Muslims had to have their own land. A united India could never have worked out. Days prior to the country’s founding, he urged his people to forget the past, to bury the hatchet, to work together no matter to which community or religious faith they belonged. He told them clearly that a state can progress and thrive only when each man is an equal citizen of the state, with equal obligations, rights and privileges. He told them that the first duty of any government was the imposition of law and order, he warned against the pernicious subcontinental affliction of bribery and corruption, of nepotism and jobbery, and clearly and emphatically stated that the citizens of his country ‘may belong to any religion, caste or creed — that has nothing to do with the business of the state’. Once he was dead, those who followed swiftly broke faith with him and it took them but six months to betray both Jinnah and the people of his country. They managed to do everything he had warned them not to do, and those that have followed the followers have succeeded beyond Jinnah’s wildest dreams in converting his country to quite the opposite of what he intended and in polluting the minds of its people. It was not to be for better, but unequivocally for worse. To say that the leadership the country has suffered over its 62 years has been disastrous is but to overstate the obvious. Sadly, it must be admitted, Jinnah had an inkling that he was bequeathing his country to those who would prove unworthy inheritors of his labours (never did he utter the word ‘sacrifice’). This newspaper of record which informs us on its masthead each day that it was founded by Mohammad Ali Jinnah, has allowed me to reiterate time and time again words spoken by that great man to his friend, my father Rustom Fakirjee Cowasjee, when one day he remarked, in dismal tone: ‘Mark my words, each successive government of Pakistan will be worse than its predecessor.’ And so it has been — such is our fate. Though, today, it is difficult to believe that any successor can be much worse than what we now have sitting. But, then, with what we have on the ground which is likely to follow, Jinnah’s prescience might continue to prove to be accurate. The lethal mixture of state and religion, imposed upon us by the Objectives Resolution of 1949 has ensured that bigotry and intolerance would flourish, that discriminatory laws would be imposed and would be immoveable, that sectarian killings would be a daily occurrence and that the threat of Talibanisation would be a reality with which we must live, though our mighty army has now taken up the fight. The question is, with the deterioration that has set in, can the fight be won?